The Creditinfo Predictor is a report that shows only the scoring information of the subject including a calculation of the historical scoring. The Creditinfo Predictor has been developed to provide users with a single assessment of the individual. 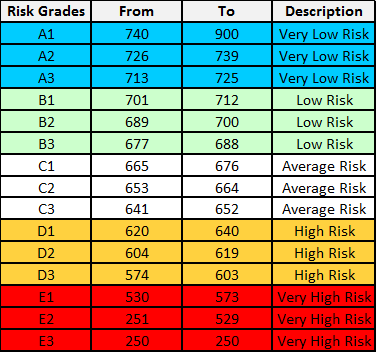 The score is represented by a number from 250 to 900 which is also accompanied by a risk grade ranging from A to E. Essentially, the higher the score the lower the risk. To interpret the score, the key drivers of the score are shown in a series of reason codes. The reason codes are frequently used in manual underwriting as an indication of the areas that require in-depth review. Creditinfo will conduct constant reviews and statistical analysis on the Creditinfo Predictor to ensure users have the most predictive and effective risk assessment tool available to them. Pre-screening of prospective customers, the benefit of this will be that customers are not contacted for the products that they are not eligible for.